Trusted Quality and Craftsmanship From a trusted brand known for quality, traditional craftsmanship and comfort, the La-Z-Boy Bellamy ComfortCore Traditions Executive Office Chair delivers advanced comfort technology for exceptional support and comfort at work and play. Superior Comfort Technology The Comfort Core Plus with Memory Foam advanced layering system offers unique zone-based support, placing cushioning in the areas you need it most. The strategically-assigned plush body pillowing and padded headrest on this executive office chair combine to provide neck support and minimize pressure points for relief from discomfort caused by prolonged sitting. Ergonomic Design This ergonomic chair is fully adjustable for a personalized fit. You can control the height, tilt and lift to suit your needs for customized positioning and optimized body alignment. The contoured lumbar area provides tailored lower back support to alleviate discomfort. Built to Last This leather office chair features a thicker plywood sub core, reinforced back bar and heavy-duty castors for durability you can count on for all your day to day activities. 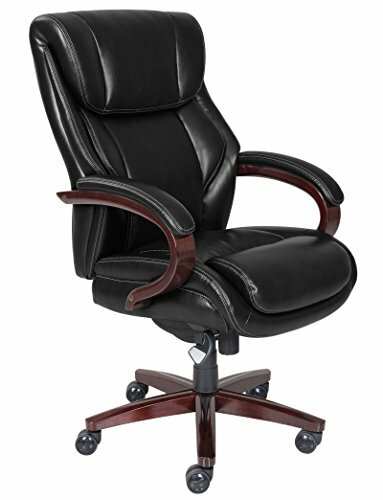 Traditional Style, Contemporary Functionality Crafted with wood components, this high-back office chair with hand-sculpted arms is upholstered in soft bonded leather to create an elegant blend of traditional style and modern performance that is ideal for any office, home or entertainment space. If you have any questions about this product by La Z Boy, contact us by completing and submitting the form below. If you are looking for a specif part number, please include it with your message.